Ikkaku is a famous chicken restaurant from the Marugame district of Kagawa. Marugame is an area just west of Takamatsu. 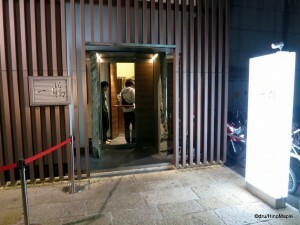 It is more famous for their udon, rather an udon shop called “Marugame”. Also note that Marugame, the shop, is actually from Hyogo, not Marugame city. Ikkaku however is from Marugame. It is a small chain of chicken restaurants with only 4 locations in Japan. They have their Marugame shop, a Takamatsu shop, and one shop in Osaka and Yokohama respectively. When I first visited Takamatsu in 2009, I was told by my student to visit this chicken shop. I went there and put my name onto their list. It was a relatively small shop on the top floor of the building. As you got off the elevator, you entered the main entrance where you put your name onto the waiting list. You are then surprised by the line which extended onto an outdoor balcony for about 20 metres. It was insane but I had to try it. Last year, they moved into a new location that is a lot bigger and a lot nicer. It was a beautiful shop located just around the corner from the original shop. If you are in Takamatsu, from Takamatsu Station, just head down the shotengai and turn right when you see Starbucks. Then turn left at the first intersection and you’ll see Ikkaku on your left. The shop is a victim of its own success as I saw many potential customers decide to leave as they didn’t want to wait. The food is delicious and in my recent visit to Takamatsu for the Setouchi Triennale, I visited Ikkaku twice! It really was that good. Ikkaku only has a few items on their menu. There are only 2 main dishes to order, the Oyadori or the Hinadori. The Oyadori is a tough bird to eat. It is cooked very well making it a chore to eat, but it is delicious. The best one to eat is the Hinadori. It is a very soft and juicy chicken leg that is sitting in its own fat. 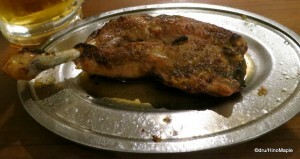 The chicken is very salty and peppery, and the skin is very crispy. While it may sound like the chicken is overly spiced, it is perfect, and when drinking beer with it, you can’t stop drinking! There are 3 sizes of beer, the small, regular, and jumbo size. The jumbo size was large enough to fit a little baby inside it. It was just the right size for me and one piece of chicken but it does have a slight premium on the price. Other restaurants in the area try to replicate Ikkaku’s chicken, and while I haven’t tried it, they don’t look the same and they probably aren’t as popular. Whenever I’m in Takamatsu, I will have to go to Ikkaku at least once. It is akin to saying you have to eat udon when visiting Takamatsu. You just have to do it. While the chicken is the main attraction, Ikkaku does have various other side dishes you can enjoy. I tried the Japanese style ham, which was salami with bonito flakes. I also had the curry tofu and cucumber. They were both nice but my only regret was not trying the Torimeshi, or chicken rice. It was a small bowl of rice with grilled chicken on top. It looked delicious but since I was already eating the regular chicken leg, I didn’t bother to try it. I wish I had tried it but that may be in the future for me. 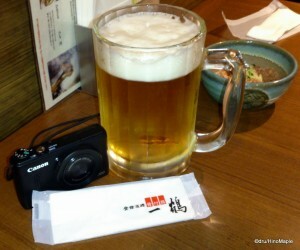 I don’t plan to go to their Yokohama shop anytime soon as Yokohama is not a place that I would naturally think to visit. I would consider it in Osaka but that is also unlikely in the near future. If you do have a chance to go, I highly recommend going there as you will not be disappointed. This entry was posted in Shikoku Food and tagged chicken, food, Hinadori, Ikkaku, japan, Kagawa, Marugame, Oyadori, Takamatsu, Torimeshi by Dru. Bookmark the permalink. Actually, I believe that are three locations in Takamatsu. The one downtown that you’re mentioning, one in Ota (the part of Takamatsu that’s just south of the highway) and my wife tells me that there is one in Yashima also (not on the mountain, but in the neighborhood), and yes, I do recommend the place. “The jumbo size was large enough to fit a little baby inside it.” This made me grin. The chicken sounds very nice – so does the beer – but do they have chocolate pudding?! Looking at the menus, there is no chocolate pudding. I’m sure you can find another place for it there. You can always have the ice cream.